If you’re a homeowner, you know the value of your home’s curb appeal. After all, there’s just something about pulling up in front of your home at the end of a long day of work and letting it put a smile on your face. When your home looks its best, it makes you excited about living there. The good news is that you don’t need a massive budget and a full-time staff of professional landscapers to keep your home looking great because the siding experts at West Knox Windows and Siding can help to transform the look of your home! In addition to adding value to your home, new siding can mean increasing energy savings and even decreasing exterior maintenance. At the end of the day, that’s what it’s all about! When it comes to siding for your home in Knoxville, TN, it’s important to work with a company who knows how to get the job done the right way. At West Knox Windows and Siding, we take great pride in our credentials. We know the value of having a house that you love coming home to. It’s just a better way to live! We also believe that your home is more than just a place to lay your head; instead, it’s a reflection of your personality and your values. It just makes sense to want to come home to a place that you take pride in. Whether you’re chasing the dog in the backyard or hosting a family get-together on the back deck with the grill going, your home is what’s always in the background. People work hard to be able to enjoy a living space of their own. By working 40 hours (or who are we kidding, because there’s a good chance that you work more than that) a week, you bring home the paycheck that makes the mortgage payment possible. There’s a good chance that you spent quite a bit of time searching for the right home. When you found it, you worked with a realtor to put in an offer. Once you got word that the house would soon become your home, you probably had knots in your stomach for a month or more while inspections were done, paperwork was filed, and loans were secured. In this day and age, it takes quite a bit of effort to own a home. It only makes sense to be sure that it looks and performs its best. At West Knox Windows and Siding, we’re a local company that is family owned and operated. Quality, craftsmanship, and attention to detail are at the front of our minds for any job that we undertake. We want you to know that however big or small the job is, we’ll give it our full effort in order to help make your home a better place to live. We like to start the process by getting the details of your project, answering any questions you may have, listening to your concerns, and giving you an estimate for the tasks that need to be completed. As you can probably imagine, situations do pop up from time to time, but we want you to know that when we give you a quote, we do everything possible to stick to the exact price that we quoted you for. You won’t hear any haggling or upselling from us. That’s why we strive to come up with an accurate project evaluation with a realistic timeline from the very beginning. Our goal is to keep you in the loop every step of the way and to be thorough enough that there are no surprises down the line. At West Knox Windows and Siding, there are no pushy salespeople, no fake discounts, no shortcuts, and no fine print. We represent over five decades of quality products and service and we’re fully committed to providing the residents of Knoxville with an experience that is absolutely unmatched. At the end of the day, we’re dedicated to providing quality work on every job, and we have a guarantee to back that work up. It’s as simple as that. With several colors and styles of siding to choose from, you can ensure that you get the look that you’re going for with your home. We know exactly how big of a decision it can be when you decide that you want to replace your home’s siding. When you choose to partner with West Knox Windows and Siding, you can rest assured that our goal is to make the decision as pain-free as possible. There’s nothing quite like an extra pop of color to completely transform the look and feel of your home. Whether you prefer a relaxing shade of blue or an energizing pop of orange, we can help to make your home a true thing of beauty. From shake siding to board and batten to dutch lap to straight lap to scalloped, we can handle any job that comes our way. We even specialize in the installation of new vinyl soffit and fascia to help give your home the perfectly finished touch that you’ve been looking for. 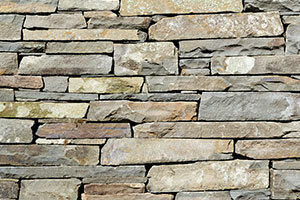 Stacked stone siding can add a sophisticated look to any home. 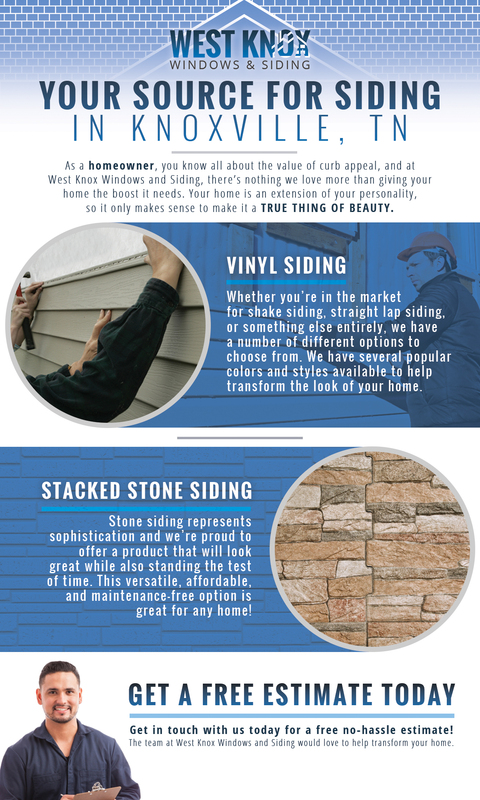 In the past, adding decorative stones onto your home could be a bit of a risky business, but the great news is that thanks to modern manufacturing, stacked stone siding looks absolutely amazing and can last for many years. At West Knox Windows and Siding, we are proud to offer stone siding installation as one of our specialties, ensuring that you get the look that you want for your home. This type of siding is incredibly affordable, and perhaps best of all, it’s nearly maintenance-free, providing you with more time to handle the stuff that really matters in life. Available in a number of different colors and styles to suit the unique needs of your home, stacked stone siding can make a massive visual difference when it comes to your Knoxville home. When you choose to partner with West Knox Windows and Siding in Knoxville, you can rest assured that we know the value of a hard day’s work. Because we start our process off by coming right to your home or office, we’re able to get a good look at the scope of work that needs to be done. As we mentioned above, we strive to ensure that there are no surprises, allowing you to plan accordingly, knowing that we are dedicated to getting the job done within the timeline that we specified and within the budget that we quoted. At the end of the day, it’s peace of mind that customers are seeking and that is exactly what our team wants to provide you with! If you’re in need of siding for your house in Knoxville, TN or the surrounding area, we’d be glad to help make certain that you get exactly what you home needs to look its best. You’re the one who knows best about what your vision for your home is and we take great pride in helping to make that vision a reality. Of course, we’d be happy to offer advice at any point along the way! Installing siding–as is the case with many different types of work that you could have done around your home–relies heavily on an attention to detail, and the good news is that our team of experts is singularly focused on providing each and every one of our clients with high-quality work time and time again. We believe in doing things the right way the first time around because we’ve experienced situations ourselves in which we were called out to fix someone else’s mistake. The truth of the matter is that it happens to everyone at some point or another. The allure of getting work done for a low price is certainly tempting, but how much money is really being saved when you have to pay to have that work done twice? Instead, the best solution is to go with a true professional the first time around. When you choose to partner with the team at West Knox Windows and Siding, you can rest assured that our focus is fully on doing the job the best that we can. It’s why we have no hesitations in offering the amazing guarantee that we do. We mentioned above that we know how stressful it can be to undertake a large project from your home, but at the end of the day, we want you to have the peace of mind that comes alongside knowing that you made the right choice for your home’s siding. Contact us today to schedule a consultation and we’ll prove to you what makes us different. West Knox Windows and Siding has been a recipient of the Angie’s List Super Service Award for a number of years now and we’ve also received awards from Houzz, Home Advisor, and more. 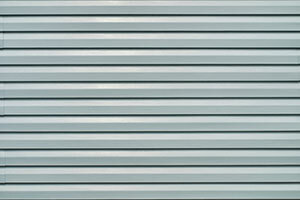 Additionally, we’re an Energy Star Partner as well as being a Pro-Certified Siding Installer. We’re proud of what we’ve accomplished, sure, but at the end of the day, it’s the opinions of our customers that matter most to us. There’s absolutely nothing that we love more than hearing that the homeowners who utilize our services are pleased with the work that we’ve done. Speaking of which, as our name implies, we also specialize in windows as well, so if you’re home is in need of a makeover, we proudly install a number of different types of replacement windows. Like having the siding on your home refreshed, replacing windows can be stressful, but the same qualities that we bring to the table for siding installation are present when we’re working on your windows as well. We can even handle installing new sliding doors and installing new gutters! In short, we specialize in all of the things that you need to boost your home’s curb appeal and make your living space a better place to live. At the end of the day, what we want most is to provide you with the perfect solution for making your home more visually appealing while also ensuring that it’s protected from the elements. Improperly installed siding can cause a heap of problems that no homeowner wants to deal with; the good news is that we know how to get it done the right way, ensuring that the end result is a home that looks great, displays your personality perfectly, and keeps your family safe. Whatever change you’re hoping to make for your home, you can count on the team at West Knox Windows and Siding to handle everything from vinyl siding installation to stacked stone siding installation. No job is too big or too small for us and we’d be honored to come out and give you a free quote. Have a question for us about your next project? In need of more information about our lifetime guarantee? We would love to hear from you! Contact us today to get a free quote. We look forward to hearing from you!